We love having long and special breakfasts on the weekends, and when you can make cafe style breakfasts at home - why go out? Hash Browns are always a favourite and I was surprised by just how easy it was to make them using the Kambrook Air Fryer. All it took was a light spay of oil to create the golden and crispy Hash Browns that we all love, the only problem is now that I know how easy they are to make I won't be able to stop cooking them. I’d always put making my own waffles in the too hard basket when the reality is it’s so easy! I recently tried the Kambrook Waffle Iron for the first time and have instantly fallen in love with the thick and delicious waffles it makes in just minutes. While I’ve been having a lot of fun experimenting with different waffle flavours (hello double chocolate chip!) you really can’t go past a traditional waffle recipe - especially when you turn it into the ULTIMATE breakfast sandwich! Everyone loves a celebration cake and they don’t come much more spectacular than this fun Piñata Cake. Don’t be put off by the name, this Piñata Cake is actually really simple to make and put together. The Kambrook PowerMix Planetary Bench Mixer made making these cakes and the buttercream icing quick and easy thanks to it’s powerful mixing action and the way it combines ALL of the ingredients in the bowl - meaning you don’t need to stop halfway and scrape down the sides and bottom of the bowl. It comes with three attachments, a dough hook, paddle and whisk and the whisk is perfect for mixing cake and icing to create a light and fluffy mixture. Place all ingredients in the bowl of your Kambrook stand mixer and beat on low speed until combined. Increase the speed to high and beat until just smooth. Carefully remove the cake from the oven and allow to cool for 5 minutes before turning onto a wire rack to cool completely. Remove from the tin when cooled. Once the cakes have completely cooled you can make your chocolate buttercream icing. Place the softened butter into the bowl of your Kambrook stand mixer and beat on a high speed until it’s pale and creamy. Add the sifted icing sugar, cocoa and vanilla essence and beat until well combined. Trim each of your cakes to ensure they are even - make sure you trim the TOPS of the cake and not the bottom. Set your cooled cakes, buttercream, M&Ms, spatula, spoon, serving plate and 8cm wide round cutter onto a clean bench. Place the first cake onto your serving plate and using the cookie cutter, push it down approximately half way into your cake. Remove the cutter and use a spoon to remove the round piece of cake. Hold the second cake in the palm of your hand and again using the cookie cutter, push it down approximately 1/4 of the way into the middle of the TOP of your cake. Remove the cutter and use a spoon to remove the piece of cake. Set the cake down onto your bench top. Wipe away any crumbs on your serving plate and cover the cake with a layer of buttercream - leaving the hole you have made clear. 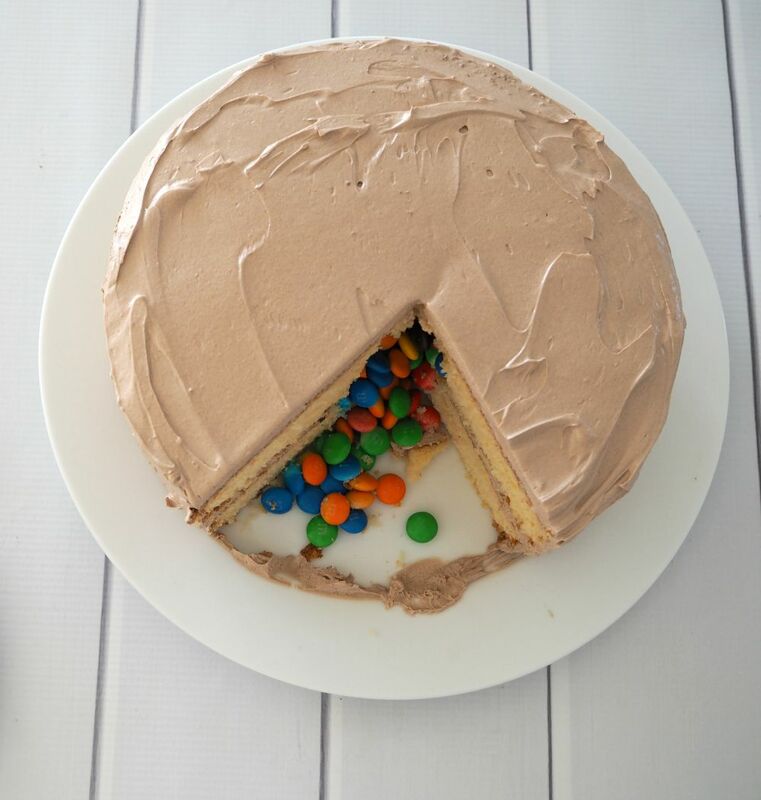 Fill the centre hole with a heaped pile of M&Ms before carefully place the second cake on top. Wipe away any cake crumbs and carefully cover your cake with the remaining buttercream and decorate as desired. Thanks for sharing this "Come Cook with Lauren from Create Bake Make"